Johnny Monsarrat's garden on Elm Street in Somerville is open to anyone. But if you stop by, he'd rather you do a little more than just admire the landscape - he's got more cosmic ambitions than that. Instead, Monsarrat invites you to bring your deepest secrets - fears, joys, failures, goals - and leave them behind as an anonymous note, on a scrap of colored paper, to the universe. The universe may not write back, but Monsarrat will, with some practical advice and an affirmation that there is someone out there who cares. Monsarrat calls his garden the Abyss, a kind of "interactive community art project" that's taking root next to his house. A short stone path leads from the sidewalk into the side yard, past trees with drooping branches and a towering abstract marble statue, and under a trellis to a circle of white and gray marble laid in a spiral pattern on the ground. That spiral, Monsarrat says, repre sents the unknown. 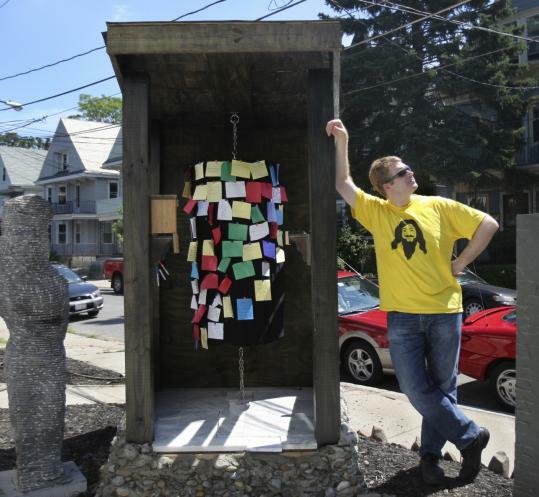 Next to it is a three-sided wooden booth where visitors can post their confessions and read the notes others have left behind - as well as the answers Monsarrat writes on the back. Though he is not professionally qualified to offer counseling, Monsarrat, an MIT graduate who runs his own data company, said, "I've got a PhD in screwing up royally and somehow surviving. I like to think that I've got some street cred when it comes to falling into the fire and getting out." At 39, Monsarrat said he has struggled with jobs, relationships, and his self-esteem, concluding along the way that happiness is not something that "just happens intuitively." In 2002, when he found himself depressed and in a destructive relationship, this self-proclaimed project-a-holic decided to make his life his next project. "Most people . . . can plan a vacation but they can't plan their life," Monsarrat said. "And I think it's because they choke. Life is big." But there are little things that people can do to change their life, he said, like making a list of what makes you happy, or leaving a note in the garden. "These little exercises really help you figure out where you want to go," he said, noting that the first step - the decision to make a change - is by far the hardest. More than 100 cards have been left in the garden since it opened July 12. Monsarrat designed and built it, with help from his roommates, and posted a sign near the sidewalk at the garden's entrance explaining the project and inviting passersby to enter. He said he's spent about 100 hours and a few thousand dollars on the project so far. Most visitors, he believes, end up at the Abyss by accident, and some of them return to read his responses to their messages. Some notes are chilling: "I'm so lonely I can hardly breathe." Some are uplifting: "Nothing to confess today. Full of love and gratitude." There are playful Star Trek references - "Kirk or Picard?" - and notes scrawled in Spanish and Chinese. One note was alarming: "Sometimes I don't think there's a point to my life," and Monsarrat advised the writer to seek professional help. Monsarrat said he often channels "Dear Abby" as he responds to notes like "Will I ever meet Prince Charming?" or "Why is it that boys don't find me attractive?" But for the most part, he tries to inspire people to pursue their goals and think positively. He reminded one person that, thanks to modern dentistry, their teeth are in better shape than those of the old kings of England. "See?" he said, "There are a lot of things about life that are good." "The unknown is always scary," Monsarrat wrote on the website he created, crossintotheabyss.org. "But there are simple, nonscary actions you can take to defy that fear. You can step into the garden. You can write on a card. Sure, there's more to come! But you've just proved you can face it."